The LIT Reflex Ultra-Reflective Tire is ready for the city streets no matter the conditions or time of day. A large reflective band on the sidewall extends from the rim and almost meets the tread, creating a curvature that makes it not only visible to traffic approaching from cross streets but also to cars coming up from behind. Defense from road debris comes from a reinforced puncture protection belt under the tread, which is superbly grippy and durable thanks to its long-wearing compound and file-tread profile. I ride with these on my Salsa Vaya. After having tried various Continental and Vittoria models, I came across these. So far they've proven to be a great most-weather tire. The tread seems to be well equipped to avoid flatting frequently. So far I've logged 112 miles and haven't had any issues. I've got about 150 miles of spring riding on these tires. Lots of sand, grit & glass on the shoulder and no flats yet. They mounted easy and feel pretty supple on the road. Reflective accents are super bright. Excellent tire for the money. I recommend the LIT tire for front wheel use only. The reflectivity is best there. Less likely to puncture. I bought a pair spring 2014. Put one on the front wheel ran it for 2000 miles. Decided to put one on the rear wheel. Lasted 2 days before it punctured. Replaced it with my go to tire Conti 4 season 28mm. I usually average 1 flat a season (8-10k miles). Kept the LIT on the front. I have ridden it on gravel roads, trails and the usual roads one rides when Randonneuring. After 5k miles the tire is as expected at the end of its usefulness. The tread is square and thin the texture of the belt can be seen. The side reflective part is like thick reflective tape glued to the sidewall. It has a seam. The reflective sidewall has peeled up at the seam. I tried to super glue it back on but it did not hold so I trimmed it leaving a bit of unprotected sidewall. There is another seam where the sidewall and tread interface. This seam around the circumference has opened slightly and threads are coming loose. I will replace it with another LIT tire. Bought this tire during LIT's crowd funding campaign on CrowdSupply.com. The tire looks a lot like a Gatorskin but feels a bit more supple on the bike. I've never been into riding tires with reflective sidewalls, partly because I didn't think they really helped that much. Most reflective sidewalls have such narrow reflective stripes they can only be seen if you're riding perpendicular to a car so but when I saw the video demo I had to give them a try. Wow, they really make a difference with visibility at night. Most reflective sidewalls can only be seen from the side. The LIT tires are visible almost head on and from behind which makes them much more useful for night-time riding. I haven't been riding these long, but so far they have held up well and survived several run-ins with glass. I bought these tires to put on a second wheelset for my CX bike, which I also commute on, mostly on pavement and occasional light trails, for which my normal 33mm CX tires were overkill (plus, don't want to wear those out with the daily miles). These 28mm tires are physically closer in size to the 23mm tires on my road bike, than the 33mm CX tires - yet, they are much closer in comfort level on the street to the CX tires, especially while accelerating and hitting expansion joints, train tracks, etc. I got to put them through the rain challenge already on my commute yesterday, and they were very confidence inspiring, even through deep puddles. Add to that, the astoundingly reflective sidewalls with a nice design, which I'm sure really do help with safety on my evening commutes, and we have ourselves a real winner here. Very excited to see if these hold up as well as past commuting tires I've used - can't say for sure yet, but all signs point to yes. Even if they don't last as long as other tires, for the price and benefits, they likely still will be worth repeating. Shows up and ramps up. Highly visable this LIT is an excellent handling tire with a supple feel and decent endurance as I get about 2500 miles on them. The 28 profile allows for comfortable sojourns on dirt segments or smoothing out rougher asphalt. The illumiated sidewall seems to glow and is a great looking tire. It looks particularky good on my titanium frame. 100 lbs of pressure at max is where I pump it at 180 lbs for me. While I have them on my single speed, which I ride more than any of my bikes, it is not a race tire per se but feels like one nevertheless. In buying the LIT, I got greater comfort from switching to a wider tire, and the added safety from the reflective sidewalls! The drivers in SWFL are so dangerous between the clogged roadways and inattention, that you need every advantage. The reflective sidewalls offer that added safety margin. The wider 28mm tire is a departure from my typical 20mm, but by choice and I am extremely satisfied. I only have about 1K miles logged with them, but so far so good. The paved roads down here are made with crushed shell, so it shreds the best of tires in a fraction of the time as elsewhere...so I'm not counting on great tread wear. Tires from Conti, Vredest, Mich, and IRC don't last long either. I've had no flats to this point, and we are pretty much relegated to road shoulders, which are littered with debris and glass. So they appear as durable as any other. I'm going to try 32mm next, just to see if they'll squeeze in on my BMC's frame and fork. 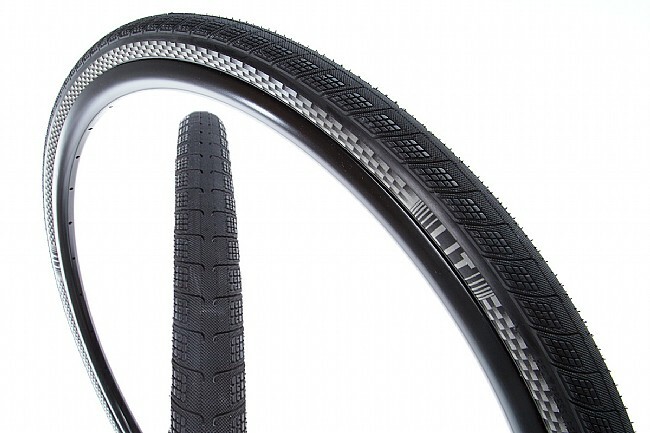 The lit 360 has got the widest reflective band of all commuting tires and it pays off. Compared to other cyclist running reflective sidewalls riding a bike with these tires like riding on a light cycle from Tron. I run full fenders and panniers and even the rear tire is still significantly visible. The only night writers that I know of that are more visible are those that are using monkey lights. Durability of these tires are acceptable I've run over glass and other debris without issue. The only time I have flatted was when I hit a very large rock at a very rapid speed and I don't think any tire would've prevented that De-airing. So far I've run this particular set for over 2000 miles and they still have the nubs on. I have a Guru Veloci Ti that I have built up with single speed elements. I love to ride and train on this bike and take it nearly everywhere which means riding on paved and dirt roads here in the NW suburbs of Detroit. Putting 28's on this bike is a tight squeeze between the chain stays but they work. They are fast and subtle feeling on the road and able to handle the dirt too. I've got over 1000 miles on this set already and there appears to be plenty of tread left even on the rear tire so far. I like the way it handles into a turn and on the straights. It feels light and at about 250 grams (I haven't verified the weight) it rolls nicely and has stood up to some dirt road abuse. The reflective sidewall, besides looking cool on my titanium frame almost glows when a light hits it. I ride this bike often in the evenings so the reflective sidewall gives me a little more confidence that I'll be seen. It installed easily on my Ksyrium Mavics and overall, especially with prices here on BTD, I'm very happy with the overall value. Purchased these for my commuter, a Specialized Secteur. I've only got 100 miles on these but they roll well and feel good on hot asphalt and cement roads. Since I'm in Phoenix AZ I have no idea how they will be in the wet but love the reflectorized sidewalls. Anything that helps the daydreaming car drivers see me is welcome. When I get more miles I'll update this review on the durability and flat protection. So far so good with these tires. Aren't the fastest but they make you super visible. Most important to me for commuting and riding around the city. A good buy. Love the reflective sidewalls, but I've had 3 punctures in 400 miles on my normal commuting route. In my experience, they've been much worse than Vittoria Rubino Pro, Continental Gatorskin, and Michelin Pro 4 Endurance from the puncture perspective. Light weight and very reflective. I like it. than my previous set. I noticed a significant reduction in rolling resistance. Very impressive visibility improvement after dark. A good product. It is too soon for me to judge durability.